Of the four gates that lead into Bergamo’s Città Alta, the most architecturally impressive is Porta San Giacomo, which can be seen from the Città Bassa below. The gate was built in 1592 from white-pink Zandobbio marble based on a design by Bonaiuto Lorini, a Florentine who had won a great reputation for his intelligent fortifications and the way he defended cities. Porta San Giacomo leads out of the Città Alta to Via Sant’Alessandro and the historic spot where Bergamo’s patron saint was decapitated by the Romans in 298 for refusing to renounce his Christian faith, which is marked by a Roman column outside the church of Sant’Alessandro in Colonna. Porta San Giacomo took its name from an ancient church that was demolished by the Venetians to make way for the new walls when they were built in the 17th century. To go out of the Città Alta through Porta San Giacomo, leave Piazza Mercato delle Scarpe by Via San Giacomo and join Viale delle Mura where you will enjoy panoramic views over the Città Bassa. 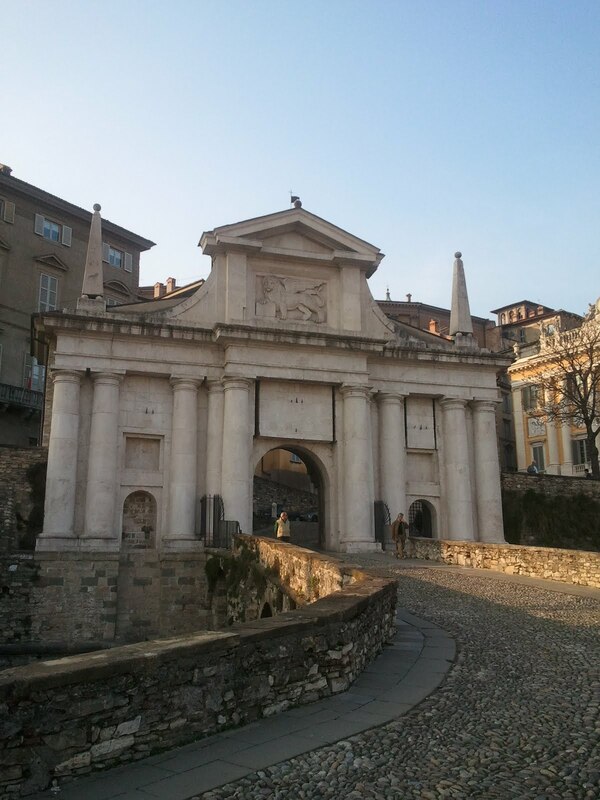 Pass under Porta San Giacomo to reach Via Sant’Alessandro, from where you can turn and take close up photographs of Bergamo’s most beautiful gate. Did Shakespeare ever visit Bergamo?